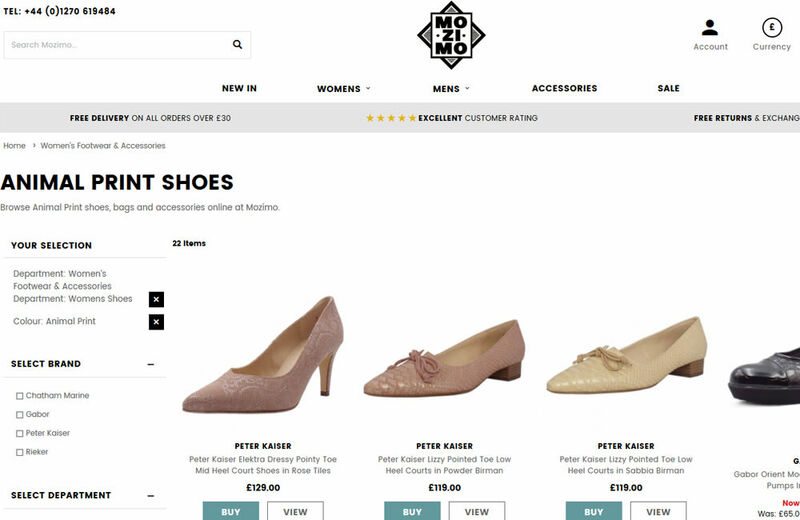 In this ecommerce site audit we will focus on the online shoe and bag store called Mozimo (www.mozimo.co.uk), which is based in the UK and currently has around 1,600 visitors per month in organic traffic. They seem to have migrated from a different CMS structure in early 2016, which gave them roughly 800 more visits per month shortly after, however this has stagnated slightly over the last year. Let’s have a look as to why that might be. Now Mozimo have done this the correct way on some of their filters, with unique sub-categories for filter items that have different H1’s, Page Titles and Unique content. However for some of their filters they have optimised the page to be unique but forgotten to create a new sub-category for it. This has a canonical to https://www.mozimo.co.uk/women-s-footwear-accessories-c70/womens-shoes-c79 and therefore they get no benefit for their optimisation efforts on this animal print page. Make sure all filters have a unique sub-category created if optimised for search. There are signs that the site has been built by cutting corners due to its size. Plenty of examples of keyword insertion snippets, product descriptions, and titles. These sort of things are great for when you first launch a website, as you can get the project completed much faster, and focus on driving traffic and conversions. However as the site begins to age, you will notice that some of your pages aren’t getting very good CTR’s, or perhaps have a high bounce rate. 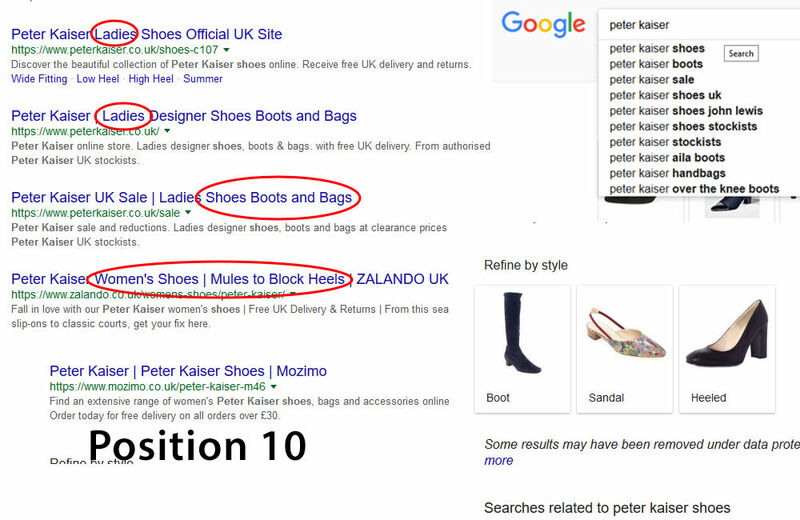 In our example of the “Peter Kaiser shoes” keyword which has 5,400 of highly targeted searches per month, there are some key points to focus on. Every top ranking snippet in the result mentions the keyword women or ladies, which shows that this is what gets the click. The Mozimo site contains neither of these variations in the page title. 2. People are looking for lots of types of shoes. The top ranking snippets also mention different types of shoes such as boots and heels, and combined with this the suggested searches and refine by sections also suggest people are looking for more varieties. So in order to attract more clicks, the snippet should mention the other varieties / types stocked. 3. If you search for the brand why would you shop away from the official site? Realistically, the only reason you would buy a brand named product away from the real brand is price or availability. Therefore the snippet of the brand pages should be aimed at people looking for these things. Keywords like “best price” or “sale items” could attract price sensitive clicks, and keywords like “in stock” and “fast, free delivery” will encourage those who couldn’t find or buy on the official site to choose Mozimo. Sitewide internal links can be the biggest leak in website authority for an ecommerce website, because they have so many pages that they end up carrying a lot of weight. 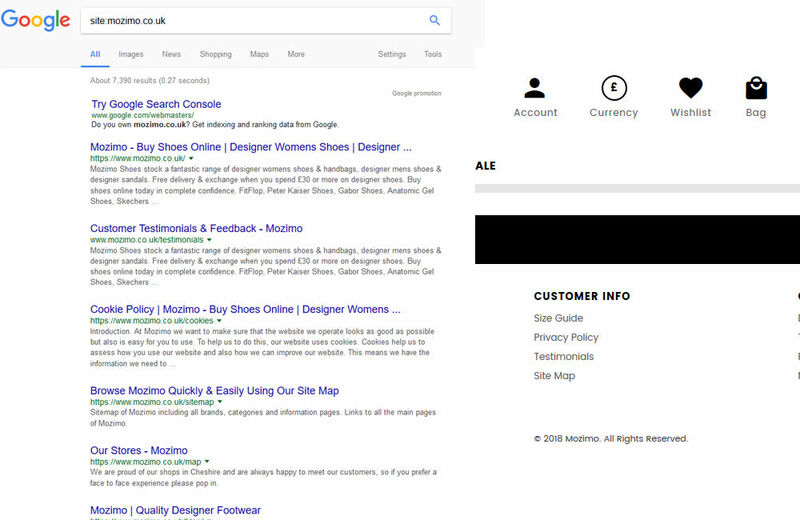 When checking the site:mozimo.co.uk Google results we can usually determine which pages have the most internal links to them on the website. In the Mozimo results we can see that pages considered useless from an SEO traffic perspective are showing up top, such as the wishlist, cookies and sitemap pages. Add the rel=”nofollow” attribute to all sitewide links to pages that don’t benefit your SEO. Noindex pages that don’t benefit your SEO. Add internal links from all sitewide linked pages (that are followed) to your main SEO target pages. 151 broken backlinks that need redirecting / restoring. Some interesting hidden links on the official Peter Kaiser website categories back to Mozimo. The over optimised homepage snippet + poorly created homepage (it uses banners in place of text in many places, and lacks internal links). Lack of niche relevant / authority inbound links. If this audit was implemented correctly, along with an authority link building campaign, the website should start to turn those 10-20 rankings into 1-4 rankings, which would drastically increase their monthly traffic and sales. 2.2 2. People are looking for lots of types of shoes. 2.3 3. If you search for the brand why would you shop away from the official site?